This tour departs from Central Milan at 7 am throughout the year. Spring and Autumn are perfect times to visit, enjoy the comfortable climate and uncrowded villages. We are comparing Cinque Terre Day Trip from Milan Prices from leading ticket suppliers and Try to find you Cheap tickets prices on the market. Cinque Terre is UNESCO World Heritage Site made up of 5 beautifully located fishing villages on the Ligurian Sea. This is one of Italy's most popular stretches of coastline and hundreds of tourists descend on the tiny fishing villages each summer. This is why having an organised tour to take care of all your transport needs is very useful. But, despite the crowds this stunning national park has retained much of its authentic Italian culture. Cinque Terre is a really unique region combining seaside tourism with fishing and local culture with history. And, there's something to please all visitors. Couples can enjoy a strolling on the piers, friends can grab a pizza on one of the local trattorias and both kids and adults can enjoy climbing the rocks and jumping into the clear sea. During your day trip you will have free time to explore the town and beaches of Monterosso before hopping on a 90-minute cruise to Portoverde. 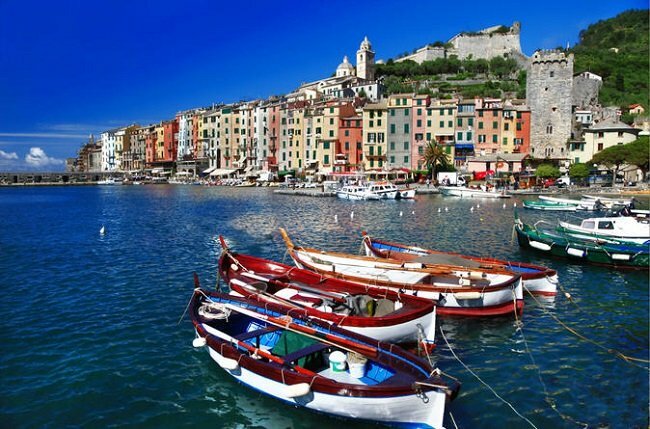 You will travel by train to Vernazza, where you will again have free time for shopping and sightseeing before continuing by train to La Spezia and coach to Milan. If you only have a limited amount of time in Italy then this full-day tour is an excellent way to see the highlights of the Cinque Terre National Park. The transfer by coach will mean that you have much more time in each village than you would if travelling by public transport. Great for active visitors and families. Your Experience With Cinque Terre Day Trip from Milan? Explore the quaint, cliffside villages and breath-taking landscapes of Italy's legendary ‘5 Lands' on a guided tour from Central Milan. Travel stress-free with a professional guide, in an air-conditioned coach to Cinque Terre. Take to the sea on a boat cruise between villages and discover the cliffsides on a seaside train. Soak up the Italian atmosphere on the edge of the stunning Liguria Coastline. Benefit from the local knowledge of your tour guide and get some recommendations for each village. Have the option to taste delicious local dishes in authentic restaurants. What Cinque Terre Day Trip from Milan Includes? Return coach from Milan city centre to Cinque Terre. Boat cruise between Portovenere and Monterosso and scenic train from Monterosso to La Spezia, stopping in Vernazza. Leave Milan and drive to La Spezia – travel by boat and train (weather dependent) between the 5 villages of the national park – ride the train to La Spezia – return by coach to Milan. Travelers Reviews about Cinque Terre Day Trip from Milan? This tour has excellent 4.5-star reviews from travellers who reviewed the tour on TripAdvisor and Viator. Reviews generally recommend this day tour and say the Cinque Terre National Park is very beautiful. Comments point out that the tour is quite long, however, comments also say that the trip is well paced and worth the journey. This tour has a 4.4-star score on Get Your Guide. There will be an English speaking guide leading every tour, tours in Spanish are available on Fridays. Food, drinks, tips and hotel pick-up/drop-off in excluded from ticket price.